Expense (actual, time tracking) InLoox PM Web App creates automatically an Expense (actual, time tracking). The time tracking items in this budget are disposed according to the activities and groups, to which they belongs. The Editing of the expense (actual, time tracking) is limited. Expenses (planned, resources) InLoox PM Web App creates automatically an Expenses (planned, resources). The total work time of all resources is multiplied by the group purchasing price for each activity. All activity expenses are cumulated by group. Each group has an internal price per hour. You can change this price/group or add a new one via the InLoox PM options. For more information see Generate and edit groups. Create a planned expense On the Edit tab, in the Common group click New Planned Expense to record expenses. The resources will be used from the planning. For more information about adding of budgets, see Create and edit a budget. 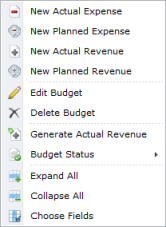 Create a planned revenue On the Edit tab, in the Common group click New Planned Revenue. A planned revenue serves a planning or proposal preparation. Create an actual expense On the Edit tab, in the Common group click New Actual Expense to record actual expenses. Create an actual revenue On the Edit tab, in the Common group click New Actual Expense. An actual expense can be also generated, e.g. with the expense positions from the time tracking. Normally an actual expense is a bill. For more information about billing, see Generate an invoice. Edit a budget Choose a budget from the budget list, which you want to edit. On the Edit tab, in the Edit group click Edit Budget. For more information about editing of budgets, see Create and edit a budget. Delete a budget Choose a budget from the budget list, which you want to remove. On the Edit tab, in the Edit group click Delete Budget. Change a budget status Choose a budget from the budget list. On the Edit tab, in the Actions group click Budget Status. On the drop-down list click status you want to have. Expand or reduce the budget view Change the view with the help of Expand All or Collapse All on the View tab, in the Common group to make clear the budget view. Choose Fields This feature sorts and organizes the project by important data. On the View tab, in the Common group click Choose Fields. On the dialog box click one field, e.g. Type, and drag it into the column headers. Reset the fields per Drag and Drop into the dialog box. Search and find a budget Click Filter in the Common group, in the View tab to quickly find the needed budget. For more information on how to use filter feature, see Search and find projects, in the Use filters section. An entry contains the following data: type (planned expenses, planned revenues, actual expenses, actual revenues),sequence number, date, status, name, amount, budget neutral, created by, created on, changed by, changed by. Each entry has a unique number. Each entry has a status, which is freely definable. For more information about the budget status, see Manage the budget status. The context menu provides you with almost all basic features that are also on the InLoox PM Web App Ribbon, such as New Actual Expense, New Planned Expense, New Actual Revenue, New Planned Revenue, Edit Budget, Delete Budget, Generate Actual Revenue and Choose Fields. It has also such features as Expand and Collapse All Groups, Status, where you can define whether the budget is Approved, Rejected or Open. Right-click in the budget list to open the context menu. You have no read permissions, if the lock icon is displayed in the list. In this case no item will be displayed. Work with the budget list - InLoox • Copyright 1999-2019 © InLoox GmbH. Tutti i diritti riservati.